Embrace is a breast enhancement treatment consisting of two parts: A supplemental pill, along with a cream to be applied directly to the breasts. As an all-natural alternative to invasive surgical procedures, Embrace claims that users can see a bust growth of up to two cup sizes in as little as 5-8 weeks. The results are permanent, but maintenance dosages are suggested to be continued in order to assure that breast size is kept at its maximum, which will be explained in the "How to Use Embrace" section. 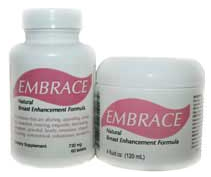 Embrace is a product of TracHealth, a New York-based American manufacturer of health and beauty items. For a one-month supply of the Embrace breast enhancing pills and cream, one will pay approximately $90 before shipping costs. Embrace is formulated with all-natural active ingredients. The pills contains a comprehensive blend of fennel seed, saw palmetto berries, Dong Quai root, Blessed Thistle, dandelion root, and other plants for the promotion of breast growth. The main active ingredient in Embrace breast cream is Wild Yam, which is a rich source of phytoestrogen – plant estrogens that weakly mimic the effects of estrogen when taken into the body, without the harmful side effects of synthetic forms of estrogen. Embrace cream also contains oats and other plants for skin nourishment and healing, which is important during breast growth for the prevention of stretch marks. Two times per day (preferably once in the morning with food, and once in the evening with food), take the Embrace supplement for 5-8 weeks. After the desired breast growth has been attained through continuous use, continue to take smaller "Maintenance" doses three times per week, in order to sustain the maximum results. At least one time per day, after wetting the skin, apply Embrace cream directly on the breasts, and massage it gently into the skin until it has been fully absorbed. This cream can be used liberally and has no dosage requirement. Embrace, while using very popular all-natural ingredients as an alternative to surgical breast procedures, does not provide studies from clinical trials to support that it is a proven product for breast growth and enhancement. If you are looking for a safe method with no posed health risks in order to grow your breasts, Embrace can be an option for you to consider. Its two-part system is helpful in assuring that the breast tissue is stimulated both internally and externally – However, there are similar treatments that are much less expensive: The combined monthly cost of Embrace pills and cream is around $90.